NOAA's Space Weather Prediction Center is the official U.S Government source for space weather forecasts, alerts, watches and warnings. NASA and NOAA,as well as the US Air Force Weather Agency (AFWA) and others, keep a constant watch on the sun to monitor for space weather effects such as geomagnetic storms, the idea being that with advance notification many satellites, spacecraft and technologies can be protected from the worst effects. They got to witness a doozy today; an M6.5 flare on the morning which was also associated with an Earth-directed coronal mass ejection (CME). CMEs are another solar phenomenon that can send billions of tons of solar particles into space and can reach Earth one to three days later. CMEs can affect electronic systems in satellites and on the ground. which occurs when they connect with the outside of the Earth's magnetic envelope, the magnetosphere, for an extended period of time. 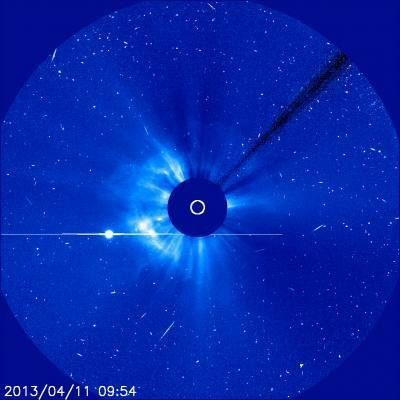 The recent space weather also resulted in a weak solar energetic particle (SEP) event near Earth. These events occur when very fast protons and charged particles from the sun travel toward Earth, sometimes in the wake of a solar flare. 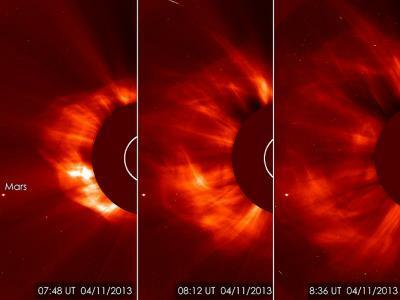 These events are also referred to as solar radiation storms. Any harmful radiation from the event is blocked by the magnetosphere and atmosphere, so cannot reach humans on Earth. Solar radiation storms can, however, disturb the regions through which high frequency radio communications travel.